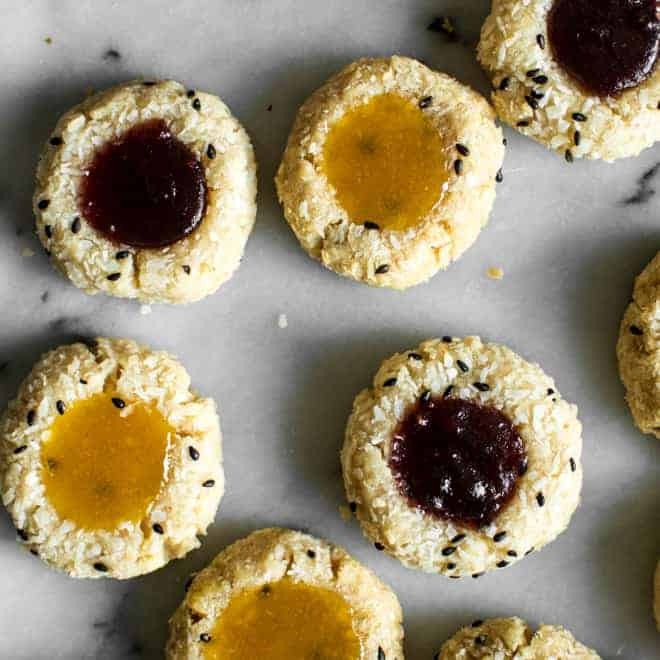 Here’s a gluten-free Chinese almond cookie recipe! 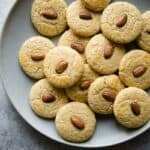 They’re made with a combination of almond and oat flour, which gives the cookies a nice chewy texture, and they take less than 10 ingredients to make! I’m horrible about baking holiday cookies mainly because it wasn’t part of our family tradition. 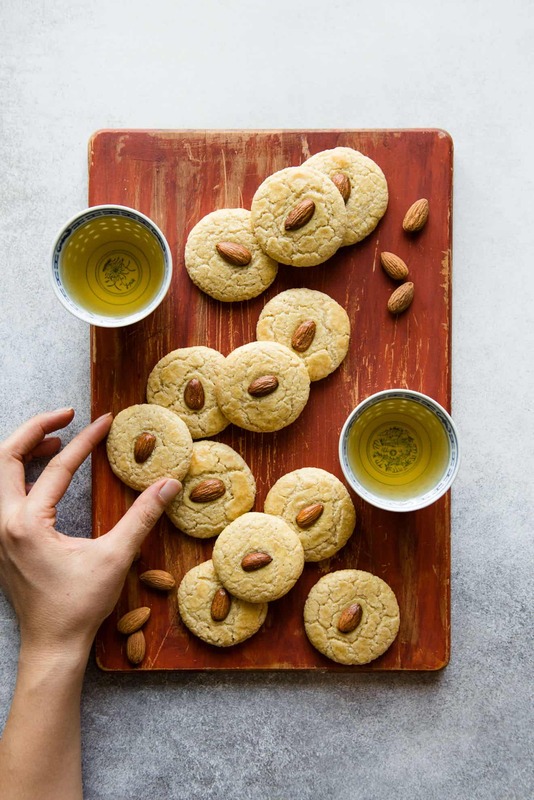 Growing up, we usually had Chinese cookies around the house—cookies with funny names, such as “blind man cookies” (盲公饼), walnut cookies and almond cookies. 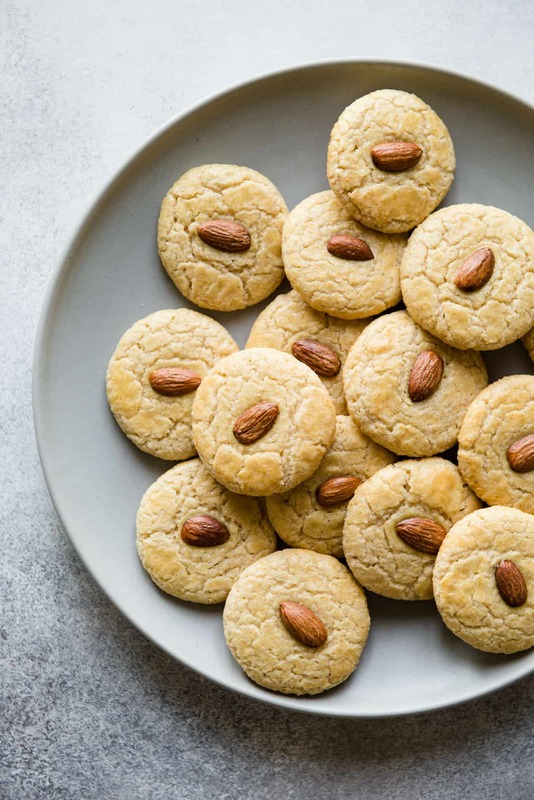 Almond cookies were my favorite because they weren’t too sweet, and they were nutty in flavor. 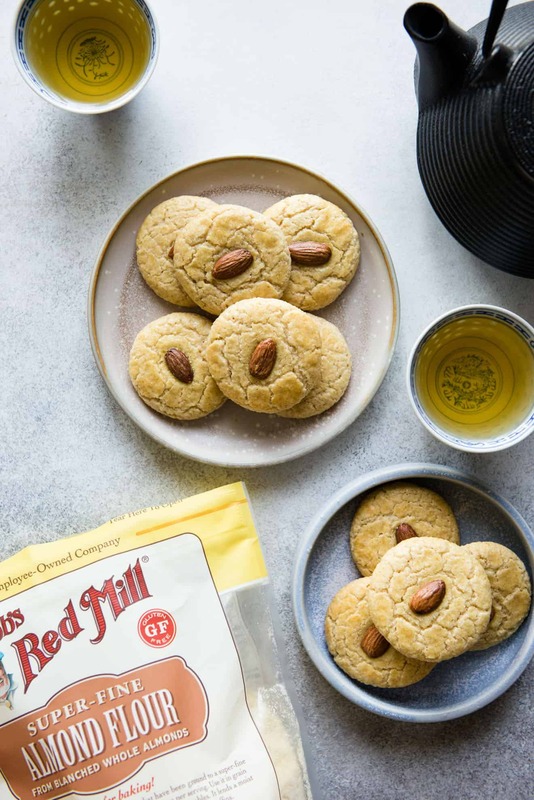 Bob’s Red Mill challenged me to recreate one of my favorite childhood cookies, so I decided to make a gluten-free version of Chinese almond cookies. The batter is made from a mixture of Bob’s Red Mill’s super fine almond flour and oat flour. 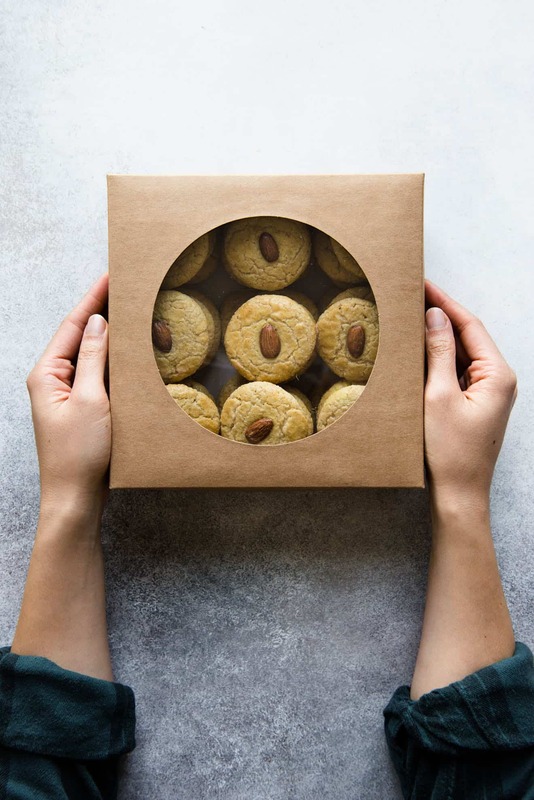 BRM’s super fine almond flour is great for baking because the almonds have been blanched to remove the outer skin before they’re ground into a very fine powder. You won’t find chunks of almonds in here! 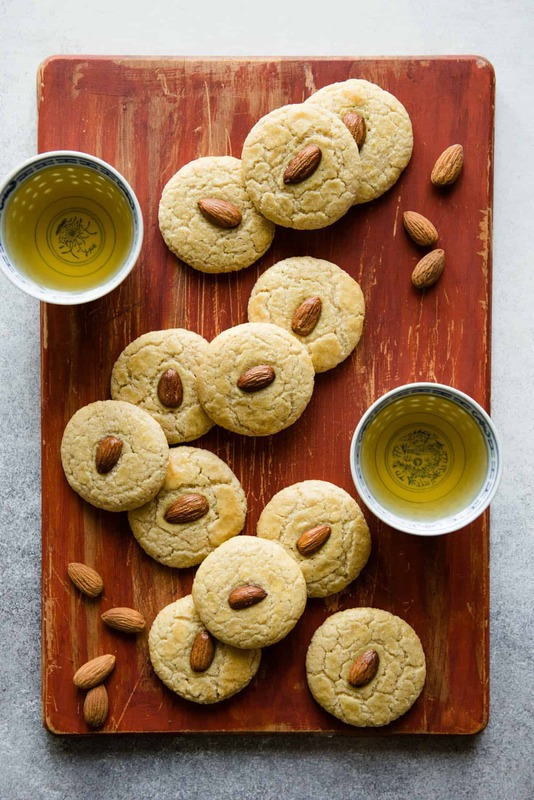 Unlike packaged versions, these gluten-free Chinese almond cookies are chewy, which I prefer. My husband probably ate 15 to 20 of these cookies in the last week and my neighbors raved about them. I’m also planning on making a special batch for my husband’s family in the UK, whom I’ll be visiting over Christmas. I don’t think they’ve eaten anything like these cookies before, so I’m sure they’ll be a nice addition to the dessert selection. The dough: It will be on the soft side, but it shouldn’t stick to your hand when you are rolling it out. Try to be gentle as you work it. Failed versions of this recipe: I tested many, many batches of these cookies. I made a batch using honey instead of sugar, and the texture of the cookies ended up too cakey. I also made a batch where I doubled the amount of butter. Honestly, I didn’t think the extra butter improved the taste of the cookies, so I stuck to 1/2 cup butter total. I know it sounds like a lot, but this recipe yields over 3 dozen cookies. Super-fine almond flour: The almonds are blanched to remove the outer, brown skin and ground into a very fine powder. You can also use almond meal, but you may find tiny bits of almonds in your cookies. 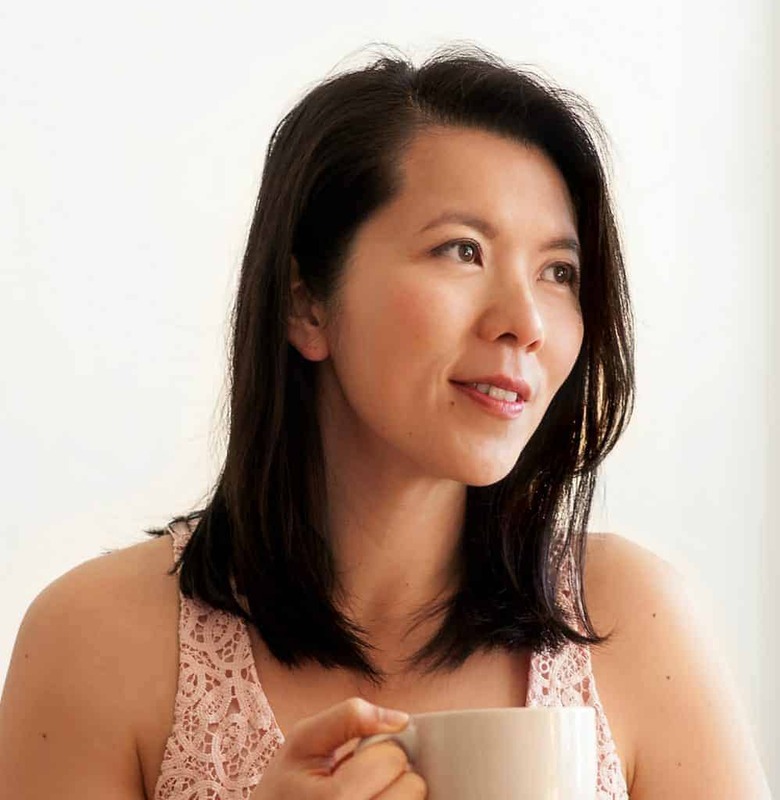 Oat flour: One of my go-to flours for gluten-free baking. 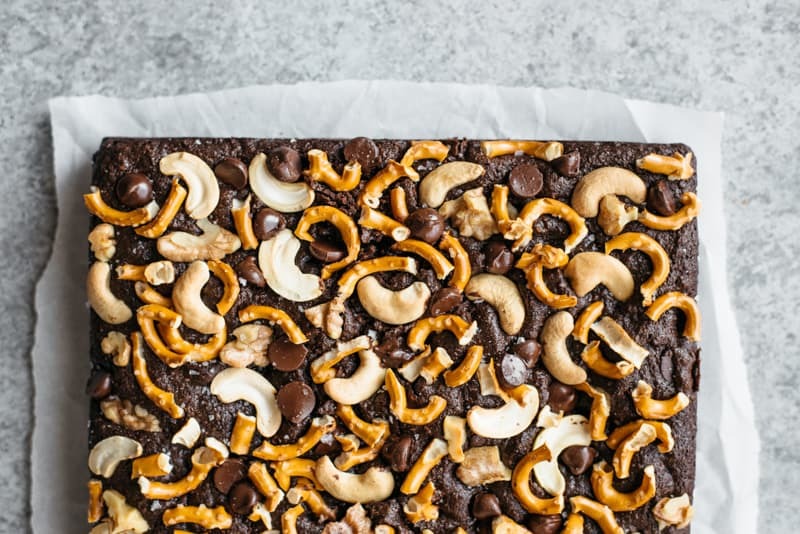 It adds a light, nutty flavor to your baked goods. Hand mixer: I don’t own a stand mixer (gasp! ), mainly because I don’t bake that often. A hand mixer is much more affordable and does all the work I need. Plus, the hand mixer takes up less space in my already-crowded kitchen. Baking sheets: It’s very difficult to find baking sheets that don’t warp or bend in the oven. I’m not sure if I have found one yet, but these baking sheets are nice and don’t warp as much. In a large bowl, cream the butter and sugar together with an electric mixer on low speed for 2 minutes. The butter should be pretty light and fluffy at this point. Crack 2 eggs into the bowl and save the last egg for later. Beat the batter for 1 minute. Add the vanilla, almond extract, baking powder and sea salt. Quickly beat everything to mix the ingredients. Finally, add the almond flour and oat flour and beat until a dough forms and you don’t see any dry streaks of flour. Preheat the oven to 350ºF and position an oven rack to the center position. Line 2 large baking sheets with parchment paper. Scoop out 1 tablespoon of cookie dough and roll it into a ball. The dough will be soft, but if you handle it pretty gently, the dough shouldn’t stick to your hand. Place the dough ball onto a baking sheet. Try to leave a 1 1/2-inch gap between dough balls. Using the fleshy part of your palm, gently tap the balls of dough to flatten into a disc, about 1 1/2 inches wide in diameter. Top each disc with an almond in the center. Crack the last egg into a small bowl and whisk. Gently brush the egg wash over each cookie. This gives the cookies a nice glossy and crackly texture on top. Once you have filled one baking sheet, pop it into the oven and bake for 12 to 14 minutes. The tops of the cookies should be lightly tan. Let the cookies cool on a baking sheet for 5 minutes before transferring them to a cooling rack. The cookies are still very soft when they come out the oven, so you want them to cool and harden before moving them off the cooking sheet. 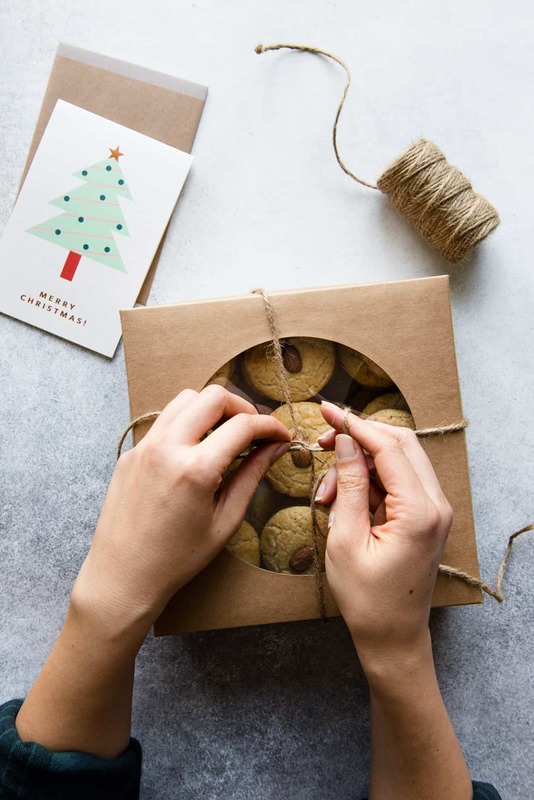 While one sheet of cookies are baking, prepare the next batch of cookies. I baked all the dough in 3 batches. When the cookies are completely cool, store them in an airtight container. I used a half sheet for baking and was able to fit about 14 to 15 cookies on it. I prefer using parchment paper over silicone mats for this recipe. The cookies kept sticking to the mat as I transferred them to the cooling rack. Disclosure: This post was sponsored by Bob’s Red Mill! 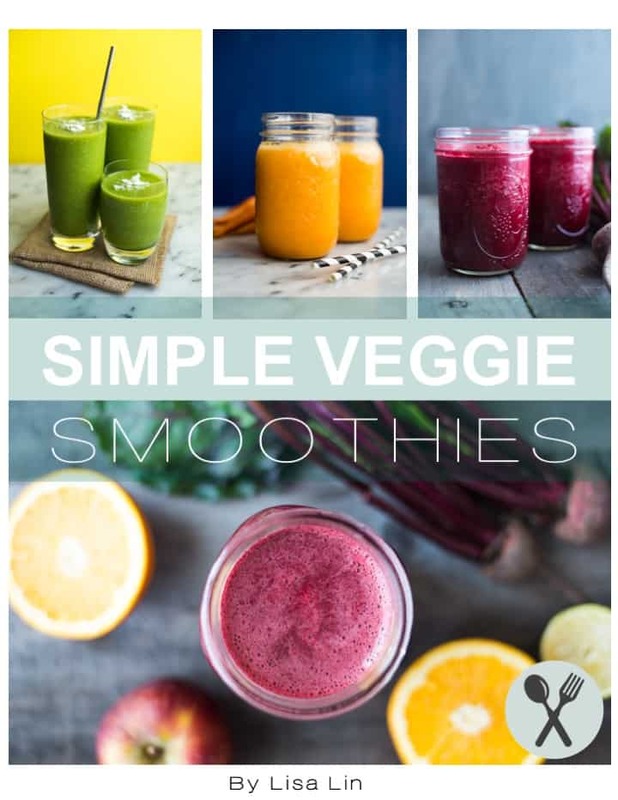 To learn more about their products and to get more recipe inspiration, follow them on Instagram or Facebook. This recipe looks great and I’m looking forward to trying it. Is it possible to alter the recipe to get a crispy texture? If so, would you please provide those instructions? Hi, Gab! It’s definitely possible, but I would have to test it a few more times to get the crispy texture down. I don’t know the alterations to the proportions off the top of my head. 1 cup of granulated sugar weighs 200g not 240g. Hi Lexi, thanks for the note. I weighed the sugar and it’s actually 220g, and not 240g, like I have in my recipe. The amount has been updated. Oat flour: You said your recipe was gluten free. But to my knowledge, oats have gluten (unless they say otherwise on the packaging). I live in Canada and I have never heard of ground gluten free oats. Hi, Marine. Thanks for the comment. In the U.S., there is a brand called Bob’s Red Mill that sells gluten-free oat flour (processed in a facility that does not handle wheat). Alternatively, you can buy oats that are labeled gluten free and blend it into a flour with a food processor. The flour won’t be as fine, but it is still very good for baking. These are the best cookies EVER!!!! Thanks! Hi. I was wondering if I can use All Purpose Flour instead of the Oat Flour ? I am very excited to try this recipe but don’t have oat flour on hand . Thanks so much for sharing this!